There are a number of waterproof covers you can use to keep your camera dry, from the high end complete with custom eye piece, to the make shift plastic bag and elastic bands! And now there’s another option, in the form of the LensCoat RainCoat. This sits nicely in the middle ground of ways to keep your camera gear dry in wet weather. It’s not as cheap as a plastic bag, but it comes pretty close to offering all the protection and quality of the high end solutions but at a cheaper price…and it comes in a range of colours, including camouflage! I’m no stranger to LensCoat products and have always been happy with the quality of the various lens covers I use and the RainCoat is no exception. Made from breathable poly tricot material (which is nice and quiet, a bonus for not making too much noise around wildlife) and with tape sealed seems the cover both repels water and makes sure any moisture that does buildup inside can escape easily. The right hand side of the cover features a pocket at the back which actually opens out to reveal the sleeve with which you can put your right arm inside, giving you access to the camera so you can keep the cover fully extended over the back of the camera and your eye to the viewfinder. This fold out sleeve/pocket also contains a small mesh velcro mini pocket so you can store any little items you may need. Crucially though, this does not store an eye piece for the RainCoat because unlike other rain covers out there, the open back means a dedicated eye piece is not needed. This for me is a good and bad thing. 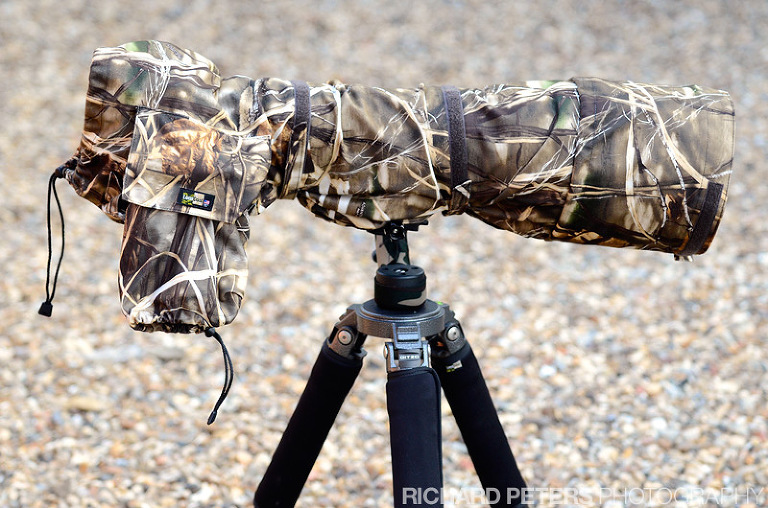 On the one hand, an open back (which can be closed by a draw string) does not offer as much protection from extremely wet and windy conditions, however, it does mean that you can use this cover with all of your camera bodies without the expense or fiddling with extra eye pieces. This is important because it makes the RainCoat even better value for money as effectively ‘one size fits all’. I have to admit, as much as the Hydrophobia is great, having to attach the eye piece to my D3s is a little annoying at times, especially if it ‘might’ rain, because then I feel I need to attach it before I head out and if I’m honest, I simply don’t find the viewfinder and all the information contained within it as easy to read when the Hydro eye piece is attached or the controls as easy to operate and see through the clear plastic screen (I use the older version 1 version, the version 2 did improve on this a little). Don’t get me wrong it certainly helps to provide a more protective rear having an eye piece and plastic rear screen, but that can equally get in your way when that level of protection isn’t needed. I like the simplicity of the RainCoat! The Rain Cover features an almost full length velcro strip along the underside (unlike the waterproof zip of the Hydro and smaller opening for feeding the lens foot through) which means it’s not only very easy to attach the cover to your lens and camera, but also that it will very easily accommodate any shape tripod head and crucially, put on and take off without having to remove the lens from the tripod. This makes using it in an emergency very quick and easy, and means the hassle of putting it on and off isn’t really a hassle at all if your shooting from your tripod. There are also two velcro straps on the body of the cover which allow you to pull it as tight or loose as you want up to the lens. The RainCoat comes in two versions, the Standard version which is a smaller one piece cover, and the Pro version which has two pieces. The larger main section and then a second, smaller section for those shooting with larger telephotos that have even larger lens hoods such as the 600 and 800mm. Both pieces have a rubbery textured strip on the inside edge where the RainCoat tightens against the lens hood, to help give a nice anti-slip grip. There is one thing I’d have liked to have seen, and that is a second sleeve on the other side for my left arm so if I’m shooting from a hide or car window my supporting arm could be protected from the elements inside the cover. But that’s just a small niggle because ultimately, if you’re shooting in the rain then you’ll have waterproof clothing on you as well as the camera! It could also be argued that an extra sleeve could potentially just get in the way when not in use, but that’s personal preference – although given the clever storage solution for the sleeve on the Rain Cover, it might not of got in the way at all. The LensCoat RainCoat is a great little product. It offers a lot of extra protection for your camera equipment without the fuss and fiddly nature of some of it’s more expensive cousins. If I’m honest, Id say that if I’m going to be shooting in very harsh weather, driving wind and rain then I would opt for a cover with more protection in extreme conditions (i.e. my ThinkTank with a sealed back) BUT, and this is a big but, the LensCoat RainCover is the one that ends up being reached for first 95% of the time. The reason is simply because it is easier to use and works with any camera I may have at any given time. It may not be perfect, but then neither is the competition and so it certainly holds it’s own against other more expensive options out there thanks to being almost as protective but easier to use and universally fitting all cameras. If you only want to purchase one rain cover for your gear, I’d say for the majority of shooters out there this may be the perfect solution. So, now you have even less reason not to get out with your camera the next time it rains!